LINK-J Networking Reception "Life Science Innovation & AI driven Drug Discovery in United States ～The present and future prospects～"
Join the LINK-J networking Reception to get the cutting edge prospects with two Speakers from California, U.S.A..
Mr. Joseph Panetta, the President & CEO of BIOCOM will give us hot and valuable updated news. The CEO & Co-founder of twoXAR, Mr. Andrew A. Radin talks about applications of AI in drug discovery. Do not miss this great opportunity to catch up the trend of World’s AI driven technology, also you can expand your network at the reception! ★As there is no seats available, we stopped accepting applications. ★Because of many applicants than expected, we changed the venue to Room 201 on the 2nd floor. ★twoXAR holds One-on One meeting on the same day for individuals or companies. 30 minute is provided for one meeting. Do not miss this great opportunity to reach the business chance for AI driven Drug Discovery. Check the details by accessing the following link. 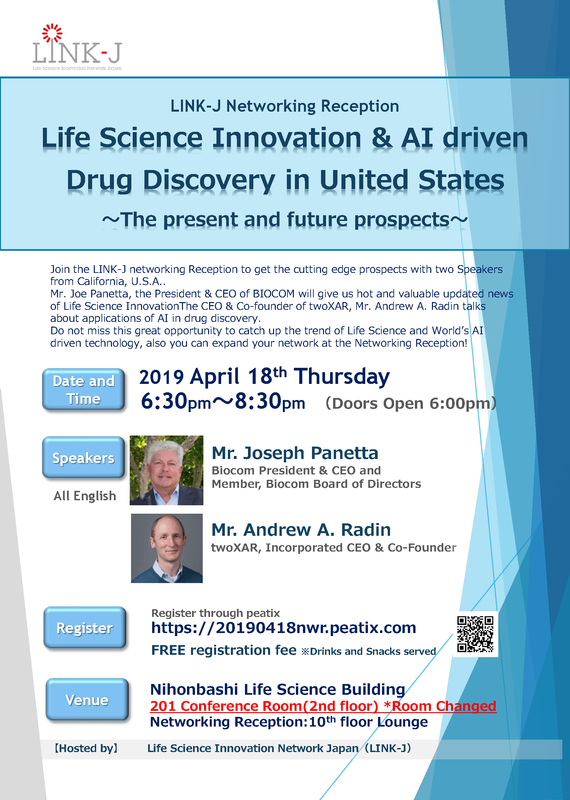 "Life Science Innovation in United States : The update and future"
"Applications of AI in Drug Discovery"
※Please show 2 business cards at the entrance to register.